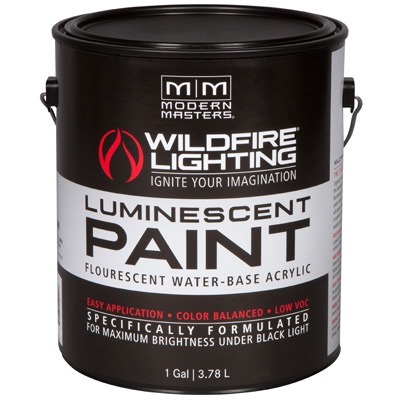 Wildfire® Invisible Luminescent Paint colors appear white under ordinary lighting, changing to bright, glowing colors when black light is applied. Wildfire® Invisible Luminescent Paints are formulated to be their brightest and truest in color when illuminated by a Wildfire® 365nm UV Black Light. They will not activate correctly if illuminated by black light wavelengths longer than 370nm. 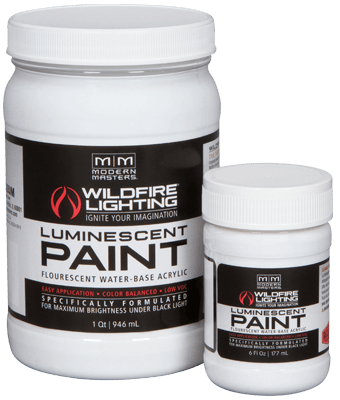 Wildfire’s Invisible Luminescent Paints are easy to apply and dry quickly to a smooth matte finish that is water resistant and flexible. It’s the tried and true choice of professionals, and for good reason. 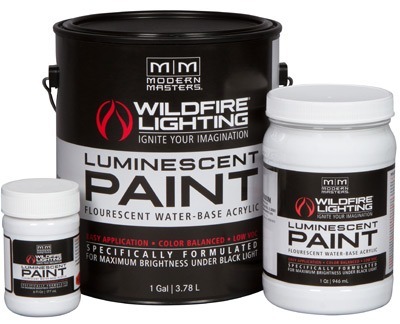 Originally developed for Hollywood’s scenic studios, Wildfire Invisible Luminescent Paint was and is the industry’s favorite choice for creating dramatic visual effects for film, television and amusement parks. In fact, Wildfire-brand paint and coating products have become the standard of quality among visual effects professionals. For brilliance, easy application, thorough coverage and true color balance, the only real choice is Wildfire.